US newspaper publisher Gannett has announced it is planning to switch all of its 80 newspapers, with the exception of USA Today, to a paid-for online model by the end of this year, bringing in an estimated to $100m a year. According to Forbes, Gannett told investors at an event yesterday that a metered system, similar to that used by the New York Times, would come into force, with a quota of between five and 15 free articles per month. 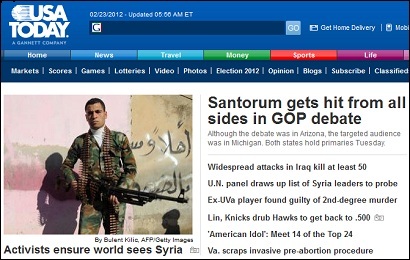 USA Today is in the midst of overhauling its website to create a user experience more similar to that of an iPad app. But any attempt to charge for its articles would likely encounter certain obvious issues. While its main national rivals, the Times and The Wall Street Journal, rely on their depth and quality to persuade readers to pay up, USA Today trades on its ubiquity. More than half of its 1.7 million circulation comes from copies distributed to readers free (or quasi-free) through hotels, airports and other hubs. This entry was posted in Journalism, Online Journalism, Paid-for content and tagged Gannett, Newspapers, paid-for content on February 23, 2012 by Paul McNally. US publisher Gannett (which is parent company to Newsquest in the UK) is trying out a paid-content model at three of its newspaper websites while it considers a broader online payment model, Bloomberg reported this week. Chief executive officer Craig Dubow told Bloomberg that Gannett is likely to experiment more before making a decision about the broad use of paywalls. Gannett’s newspaper in Greenville, South Carolina, has started charging readers $7.95 a year to access content devoted to Clemson University sports. Those subscribers view 40 to 70 pages per visit, compared with 6 to 8 pages on Gannett’s free websites, according to the McLean, Virginia-based company. This entry was posted in Business, Editors' pick and tagged Gannett, paid content, paywalls, revenue streams on March 8, 2011 by Rachel Bartlett. Shares in some of the big publicly quoted American newspaper groups rose yesterday on the back of news of AOL’s £195m acquisition of the Huffington Post. Gannett rose 2.8 per cent yesterday and the New York Times Company 2.7 per cent. According to the Associated Press, the flurry of trading activity shows that investors are still interested in news companies. “The [Huffington Post] deal raised the value on leading branded digital properties,” one analyst told the newswire. This entry was posted in Business, Editors' pick and tagged AOL, AP, Associated Press, Gannett, Huffington Post on February 8, 2011 by Paul McNally. Fourth-quarter advertising revenues at UK publisher Newsquest were down 7.8 per cent year on year in 2010, while digital revenues were on the up, according to figures published by US parent company Gannett. Gannett released its financial results for 2010 yesterday, including a detailed report of it’s fourth-quarter revenue. The US company went on to describe Newsquest as “an internet leader in the UK”, claiming that its network of web sites attracted over 65 million monthly page impressions from approximately 8.8 million unique users in December. Journalism.co.uk reported last week that staff at Newsquest titles in certain regions were understood to have been asked to take a week’s unpaid leave in response to “poor trading conditions”. An internal Newsquest memo circulated in Wales, Gloucestershire, and the South Midlands said that revenues are “considerably below last year’s performance” and therefore action needed to be taken “to drive revenues and control costs sooner rather than later”. This entry was posted in Advertising, Business, Editors' pick and tagged Advertising, Gannett, Newsquest, revenues on February 1, 2011 by Rachel Bartlett. National Union of Journalists members across a series of Newsquest-owned north-east titles have started to ballot for industrial action against proposed redundancies and a continuing pay freeze, according to a report from the union. Members at Newsquest Northeast, which includes The Darlington and Stockton Times, Durham Times and the Advertiser series, have also unanimously passed a motion of no confidence in the chief executives of Newsquest and Newsquest’s US parent company Gannett. The proposed redundancies spell disaster for the titles. It is a short-sighted policy that will result in lower quality and readership declining, as editorial staff are stretched ever more thinly. Staff are shocked at Newsquest’s preparedness to jettison so many of their most valuable assets – experienced, dedicated staff who have been responsible for the success of the titles. We are not prepared to stand by and allow Newsquest to press ahead with their plans for staff redundancies and, ultimately, business suicide. Tomorrow NUJ members at the Brighton Argus, also part of the Newquest group, will start a two-day strike in response to job losses at the title and the relocation of its subbing operation to Southampton. This entry was posted in Editors' pick, Job losses, Newspapers and tagged ballot, Gannett, industrial action, Newsquest, nuj, strikes on November 17, 2010 by Rachel Bartlett. An interesting look at a media “watchdog” blog based in the US – Gannett Blog, run by former Gannett employee Jim Hopkins, is an unrivalled source of information on the newspaper publisher and media group. An innovation on Gannett Blog, inspired by the fact that comments were getting more pageviews than anything else on the blog, is the open-ended “real-time comments” post that’s always at the top of the page. It simply says, “Can’t find the right spot for your comment? Post it here, in this open forum.” Hopkins refreshes that post once a week; it often garners more than 100 comments – far more than his typical posts do. This entry was posted in Editors' pick, Online Journalism, Social media and blogging and tagged blogging, Gannett, Gannett Blog, Jim Hopkins on November 2, 2010 by Laura Oliver. The Times finally took the paywall plunge today, but US newspaper giant Gannett has stopped short at dipping its toes. The publisher is conducting a “small-scale test” by putting subscription services around three of its local titles, reports Poynter Online. The Tallahassee Democrat, Greenville (S.C.) News and (St. George, Utah) Spectrum will charge $9.95 a month for online-only access, fees for web-and-print bundles will vary. “[W]e know this is not the model,” Marymont acknowledged. She said the company want to explore the revenue potential of niche content and the effect of paywalls in smaller markets. According to vice-president of corporate communications Robin Pence, the tests will help the company “develop a long term strategy for paid content”. This entry was posted in Business, Editors' pick and tagged Gannett, pay walls, paywalls on July 2, 2010 by Joel Gunter. Interesting round-up from Techdirt on how newspaper companies and titles report on their own paywall plans. The post follows news that US company Gannett, which owns a number of regional US newspapers and the UK’s Newsquest group, is beginning a paywall experiment. They give misleading headlines, they pretend that paywalls are some huge journalistic advance (rather than just a business model choice – and one that’s been tried and failed a bunch), and most importantly, they all totally bury the lede, and don’t bring up the paywall until many paragraphs into the article. Related reading: From news:rewired – the nouveau niche, the Times’ Tom Whitwell, Reed Business Information’s Karl Schneider and MSN UK’s Alastair Bruce on the future of paid-for news. This entry was posted in Business, Editors' pick and tagged Gannett, Newspapers, paywall, paywalls, us on June 29, 2010 by Laura Oliver. I’ve had a little play with today’s Audit Bureau of Circulations Electronic’s (ABCe) six-monthly multi-platform report for July – December 2009 and produced a few graphs. Johnston Press was top of the traffic charts with 384,016 daily unique browsers – partly thanks to the Scotsman which attracted 86,694 daily browsers on average over the past six months. In second place for daily unique browsers (which ABCe now prioritises over monthly statistics as a better measure of site popularity) came Newsquest with 320,975 browsers. Closely behind, Trinity Mirror, which recorded 287,130. Of the bigger groups, it was Northcliffe in fourth position with 256,123. GMG saw the biggest drop-off overall when period-on-period monthly unique browser figures were compared: -17.8 per cent. For the next multiplatform report, it could be all change: GMG regional titles will be part of Trinity Mirror, following the sale agreement earlier this month; and the effect of Johnston Press’ pay walls, launched in November may well have kicked in. They seem to have had a limited effect on this period’s statistics, but it’s worth noting that traffic had fallen for the Johnston Press network from 6,985,175 uniques in October to 6,161,875 in December 2009: down by over ten per cent in two months. Traffic had been dropping off since July, however, well before the pay walls were introduced and of course, the group has only rolled out the scheme over a few of its smaller sites so far. Unfortunately, the trialled sites don’t feature in the individual site break-down. This entry was posted in Newspapers, Online Journalism, Traffic and tagged abce, audit bureau of circulation, Audit Bureau of Circulations Electronic, Gannett, Iliffe News & Media Ltd, Johnston Press plc, Newsquest, The Scotsman, The Scotsman Publications Limited, Trinity Mirror, Trinity Mirror PLC on February 25, 2010 by Judith Townend. ‘Newspapers: Not as Bad as Advertised’ proclaims the headline of Glenn Rogers’ Seeking Alpha post. Succinctly summarising the problems facing the news industry, Rogers then goes on to recommend buying newspaper stocks. Gannett in particular offers a number of spin-off technology solutions to large companies; while the Times has a number of businesses outside of the newspaper. Sound investment advice or newspaperman sentimentality? Either way, Rogers’ post does look at some of the non-traditional revenue streams and business elements that could help existing media companies weather the economic and structural storms. This entry was posted in Editors' pick, Newspapers and tagged advertising market, Gannett, Glenn Rogers, media, online consumption, Seeking Alpha, spin-off technology solutions, the New York Times, The Times on September 10, 2009 by Laura Oliver.